Keyword-based opt-in is the most popular (and compliance-friendly) method for collecting subscribers’ information and building a robust list of clients, leads, customers, or others who are interested in receiving your SMS marketing and communications messages. But perhaps you already have a list of contacts who've opted in to your messaging. If that's the case, SimpleTexting makes it easy for you to import them. Prefer going over this information a little more visually? Learn how to import contacts by following along with this step-by-step video from SimpleTexting Academy. Compliance and consent are extremely important when adding contacts. If you ever have any doubts, reach out to our customer support team by clicking the chat bubble at the top right corner of your dashboard. 1. Click Subscribers on the left-hand menu of your dashboard. 2. Click Add list and give the list a name. In this example, we’ll name ours “Employees." Click Save. 3. If you have an existing file of consenting contacts, in a CSV or Excel spreadsheet, click on the blue Import Contacts button. Select the file you want to upload. 4. Ensure you set up your file with a header row so that you can easily map the fields. Download the following XLSX File to see a sample of how your contacts should be structured. 5. Choose the list you’d like to add the contacts to. In this example, we'll select the Employees list. 6. Review your free compliance message. By default, our system will send a free compliance message as soon as you complete the import process. For transactional messages sent in the U.S. that are compliant with our terms and conditions, you may choose to uncheck this box. If you plan to send marketing-related content, we advise you to keep this box checked to ensure compliance with all applicable federal regulations, industry guidelines, and mobile/wireless/cellular terms of service. 7. Agree to the terms and conditions, and choose Next. 8. Now it’s time to map the fields. When importing contacts you must include a phone number. The rest of the fields are helpful, but optional. 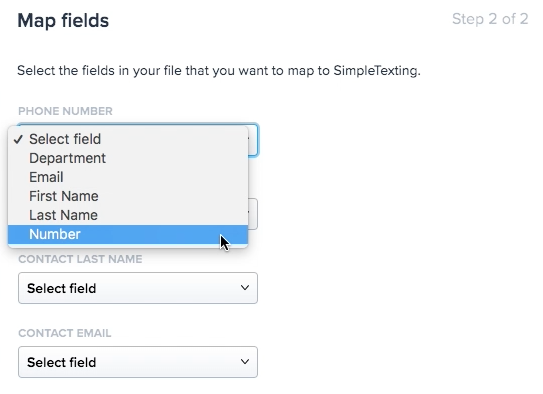 Use the drop-downs to choose which fields in your file should be mapped to the associated SimpleTexting fields. If you created any Custom Fields, you'll see these available. 9. Click Import, and you’re done! It’s a good idea to import all applicable data fields during the mapping process—even if you don’t plan to use all of them. That’s because these fields can be used later to personalize your mass text messages for each individual subscriber. More on that here. Our terms and conditions, as well as our usage policy, require that you have obtained express consent from your contacts to communicate with them via text messaging for marketing purposes. If you have any questions about obtaining and documenting consent, please consult our informational guide about SMS marketing compliance. Download the following XLSX File to see a sample of how your contacts should be structured. To download the file, click on the download button in the top right-hand corner of the new window 😁.